Pigeon decoying is a key skill to master for a large bag and fine sporting day. Follow multiple world champion clay-shooter George Digweed’s ultimate guide to pigeon decoying and you won’t go far wrong. For the best pigeon shooting guides and spots in the UK, read pigeon shooting in the UK to follow Morton Jack’s tour of the country in search of the finest sporting days. To be included in The Field’s Top 50 Shots list is to occupy a revered position in the shooting world. When you look at the names of those on it, the likes of Jeremy Herrmann, Philip Fussell, Will Garfit, Jamie Lee and many others, you may naturally assume that their prowess in the field has been honed by constantly shooting high pheasants, Wiltshire partridges or Northumberland grouse, and that they have achieved their status purely off the back of these feats. However, I beg to differ; I suggest that their prowess with a gun began at an early age, sat in a hedge or a wood, staring intently downwind for the finest gamebird of them all – the woodpigeon. 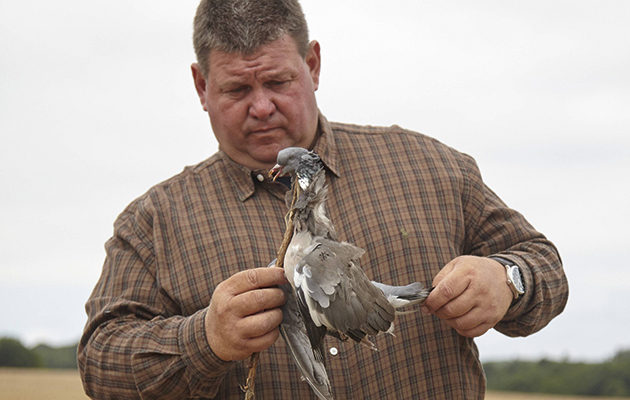 George Digweed’s passion for the wisest gamebird began as a boy. Columba palumbus frequents northern Europe in varying numbers and is regarded as an agricultural pest (and, believe me, it is; I have seen the damage it can do). However, controlling it offers some of the finest wing-shooting on the planet. In an oakwood in November pigeon offer the equivalent of high pheasants. Coming in to the decoys in the autumn they are like upwind grouse. And flighting them as they career downwind on their way home to roost is the equal of any form of driven game-shooting you care to suggest. I have pursued pigeon since I was a boy growing up with our family butcher’s shop, which sold game, including pigeon and rabbits, and this is where my passion for the wisest gamebird of them all began. I have been privileged to shoot on some of the finest estates in the land and with some of the finest game-shots the country has ever seen but I think that the exhilaration born of a day pitting your wits against an extremely intelligent bird in the autumn in solitude (apart from your dogs) is hard to better. Because of the solitary nature of pigeon-shooting you have time not only to observe your quarry but to become one with your surroundings and discern all of the other goings on often missed in the pace of modern life. As with all forms of shooting and hunting, some understanding of fieldcraft is a must for pigeon decoying. As the famous Archie Coats always stressed, “time spent on reconnaissance is seldom wasted”.  Watching a field to know when it is “right” needs an understanding of where the pigeon are coming from, how much food is on the field, how far they have come to feed on that field, roughly what time they start moving and what time they finish. Flight-lines, hedges, woods, solitary trees and water must all be considered. Erection of the hide is crucial, it must conceal not just you but also your dogs. Erection of the hide is an important part of the day. More often than not it needs to conceal not only you but your dogs. You must also ascertain how large an area the pigeon are feeding on and what you need to do to keep them on the move for most of the day. 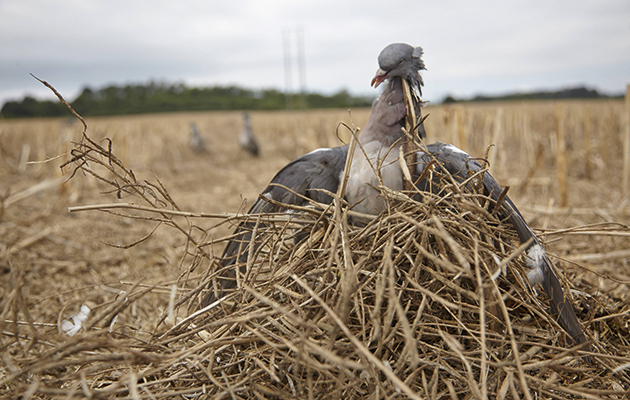 A solitary shooter will need to keep approximately 400 metres downwind of his hide clear of settling pigeon all day. This clearance contracts to only 200 metres upwind and even less if trees and hedges form a block. If the area being shot is considerably bigger than this, the outlying areas need to be “bagged off” (using fertiliser bags on sticks to scare off the birds) or a second gun should be put in a position to keep the remaining space clear. 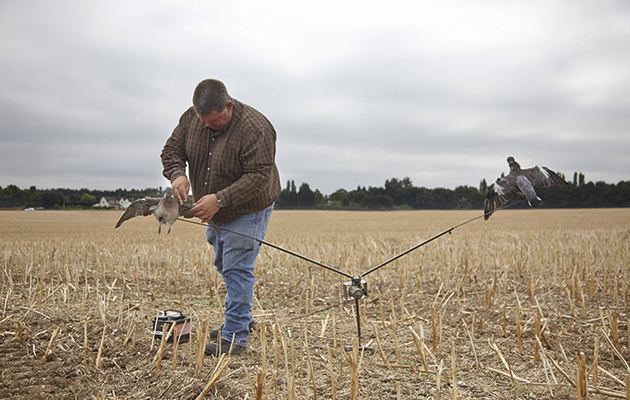 The advantage here is that two people will get sport; the disadvantage is that the increased noise puts off incoming birds so fewer pigeon arrive at your decoy pattern. PIGEON DECOYING: A MAGIC FORMULA? Try to use as much natural vegetation on your hide as possible. Much has been written and said about the magic formula for hides and pigeon decoying. In my opinion, if you have got your position right and you are well concealed in your hide, the pigeon want to come to where you are, rather than your having to attract them. If the hide is in the wrong place by 100yd or 200yd, even a layout of 100 decoys will not give you the bag you crave, because if you are 100yd out initially you will be 100yd out at the end. As for type for pigeon decoying, all sorts of plastic, flock, shell and sock imitations are, I am, led to believe, excellent most of the time. However, I don’t actually own an artificial decoy; I prefer to make sure I have got things right and if I have it won’t be long before there are enough dead birds on the ground to act as decoys. Flappers and whirlies do have a place in pigeon decoying as they provide motion but we all need to remember that the woodpigeon is a truly intelligent bird and in certain parts of the country is becoming remarkably shy and wary of imitations. 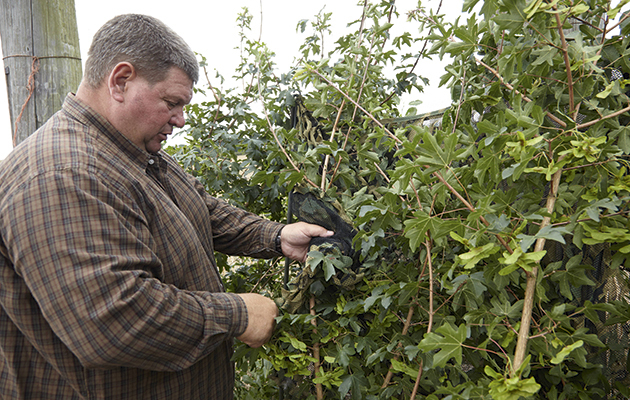 If you are using artificial devices, especially flappers and whirlies for pigeon decoying, they should be placed upwind of the hide so that the pigeon do not fly over them in getting to you. When they do come close enough for a good look, and realise the “birds” are not real, it should be too late. Whirlies should be placed upwards of the hide so that the pigeon does not fly over them. Hides have changed dramatically over the past 15 to 20 years as equipment gets more advanced and concealment methods become more technical. Gone is the era when people sourced their camouflage nets from army surplus stores and spent most of the day trying to untangle their gun from the acres of cut, dyed cloth and string. Today’s stealth nets and photo-embossed, camouflaged equipment have a blend for every month of the year and every background. However, I still use as much natural vegetation as possible, incorporating it around the net hide; this becomes even more important when using a hide in the middle of the field. Making your hide look as much like a piece of natural vegetation as possible can only enhance your day. It is also my belief that people should have more respect for the difficulty of shooting this demanding quarry. There is absolutely no question that people’s ability to shoot to their highest standard is greatly impaired by sitting down. Look at any top sportsman in any field and all those that play a moving object: their natural balance, poise and the structure of the shot they are about to complete all stem from their footwork. The writer uses Gamebore Pigeon Extreme 34g No 5 cartridges in plastic wad at reasonable and short ranges. Consequently, shooting pigeon sitting down suggests to me about the same level of respect that I would show to someone shooting my pheasants sitting down. So, either build a hide that allows you to stand or make sure you can rise from your seat swiftly, easily and safely to take the shot. As with all forms of game-shooting, shot size and load are relative to personal ability. The closer you take the shot, the more open the pattern and the smaller the shot size that can be used. At close range, the striking energy is generated from the muzzle velocity, and at greater distance it is generated by the striking energy given with the larger pellet. I would leave people’s choice of shot size for use on pigeon up to them, knowing that it is the individual’s responsibility to understand his capabilities and limits of range and skill in order to make a clean kill. And, as sportsmen, the clean kill must be our priority over everything else. My preferred cartridge is produced by Gamebore, the Pigeon Extreme 34g No 5 in a plastic wad, which we developed over a long period. It delivers a striking energy at reasonable range but also does the job at close range. “It won’t be long before I have enough dead birds on the ground to act as decoys”. People often ask me what’s the optimum moment for taking the shot. They also say, “I missed the easy one but killed the hard one.” I think you have to treat all shots with the same degree of concentration. 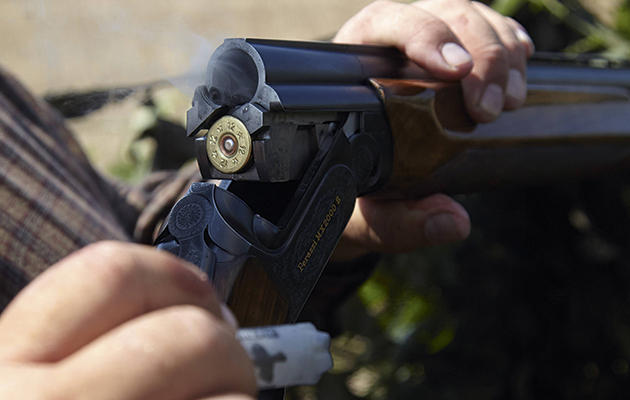 There is no such thing as an easy shot when you are shooting a clay pigeon let alone a woodpigeon that can jink, turn and quarter on the slightest movement of its wing. Keeping still until the optimum moment when you are looking to take the shot is absolutely the key to success; movement, I think, is the biggest contributing factor to making the birds jink. I am not sure that complete camouflage is an absolute necessity so long as you remain statue-still. Wind should be taken into consideration as pigeon tend to drift on the wind so a left-to-right quartering bird needs more up the right side and vice versa. 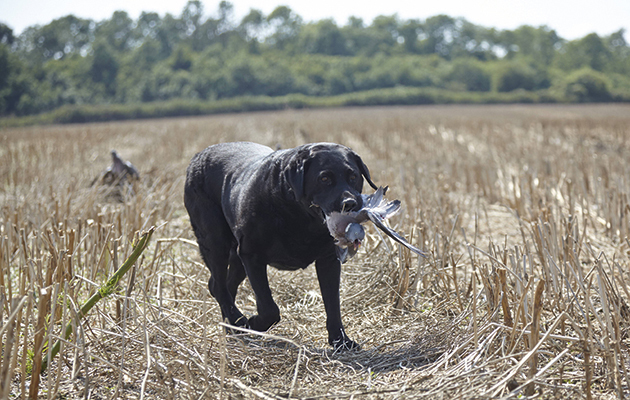 Most people shoot pigeon with over-and-unders or semi-autos, and these tend to shoot slightly high, so when the birds are coming in to the decoys you should be looking at the feet rather than the head. I think the greatest thing that you can take with you when you go pigeon-shooting is a feeling that you are at one with the elements. There is never a bad day’s pigeon-shooting; some days are more enjoyable than others, some days you will shoot more and enjoy it less. Numbers are not everything. The writer doesn’t actually own an artifcial decoy. As we’re doing this to control an agricultural pest, crops need to be protected but still we must try and pick everything we shoot. You would not shoot a hen pheasant and not make an effort to find it; equally, we must try and get every single pigeon we shoot. And having collected them, we need to keep the dead birds as cool as possible, especially in the summer, for as well as being a supreme sporting bird the pigeon is also one of the finest on the table. Above all, pigeon should be treated with the level of respect shown to the finest gamebirds on the finest estates in the land. 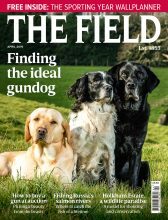 If you do this, and you learn to shoot them properly – and you understand the quarry and fieldcraft –your shooting will get better and, who knows, you might one day rub shoulders with the Editor’s 50 Top Shots.